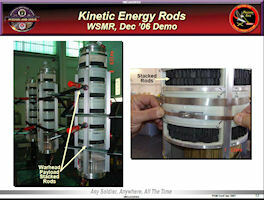 The development of a third Guided MLRS alternative warhead has been initiated. The Alternative Warhead Program (AWP) will service area target sets without producing unexploded ordnance and as of early 2010 was to be fielded in FY15. In 1QFY09 the GMLRS AWP Configuration Steering Board (CSB) Acquisition Decision Memorandum (ADM) was approved for Technology Development. 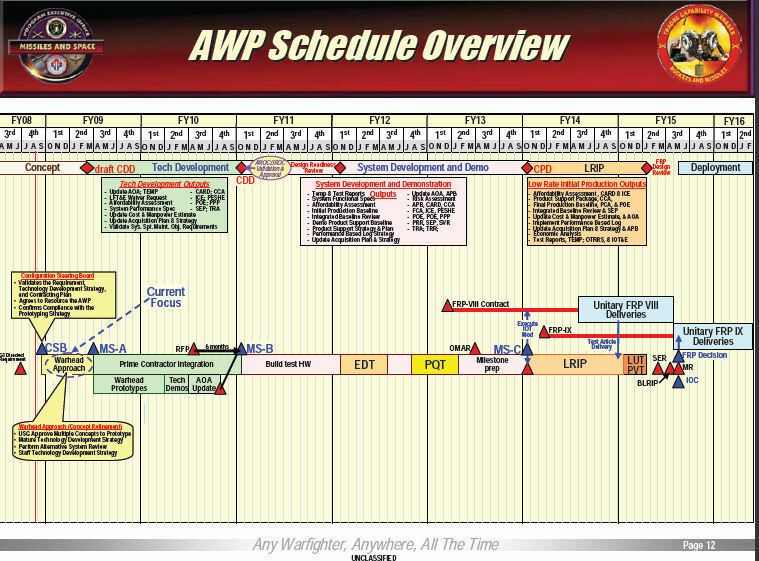 Aerojet, ATK and General Dynamics will compete for the Multiple Launch System (MLRS) Alternative Warhead Program (AWP) Solicitation W31P4Q-09-R-0002. Prototyping activities will last approximately 18 months, at which point a winner will be chosen to begin Engineering and Manufacturing Development (EMD), which will last about 36 months and cost $150 million. Currently fielded DPICM is classified as a Type I munition; the goal is either Type IV or Type V. Implementing the IM fill in the DPICM improves its IM rating to Type III. The KE Rod is completely insensitive with a Type V IM rating. A Type V Warhead IM rating will not improve the GMLRS system IM rating beyond a Type III rating-the rocket motor is most critical IM component in the GMLRS rocket. The Government's objective for the GMLRS AW is that it eliminate all residual unexploded ordnance (UXO) (less than one (1) percent required/zero (0) percent objective). Also, the Government's objective is that the AW will be equal to or better than the effectiveness requirements in the Multiple Launch Rocket System (MLRS) Operational Requirements Document (ORD). Warhead cost shall be minimized; and insensitive munitions rating shall be maximized where possible. The GMLRS AW, as integrated with the GMLRS rocket, shall be capable of being fired from the MLRS M270A1 and High Mobility Artillery Rocket System (HIMARS) launchers. The contractor shall support an Alternative Warhead (AW) Integration and Demonstration Phase that includes the refinement of AW concepts, warhead component level testing, warhead fabrication and integration with the Guided Multiple Launch Rocket System (GMLRS) and flight testing of the GMLRS AW rocket. Two warhead contractors will be awarded contracts to perform the tasks summarized in this Statement of Work (SOW). This warhead is intended to replace the GMLRS Dual Purpose Improved Conventional Munition (DPICM) warhead. The goal of the AW Integration and Demonstration phase is to develop data sufficient to enable the Government to down-select to a final candidate for further development and testing under a GMLRS AW Engineering and Manufacturing Development and Demonstration (EMDD) follow-on phase. This Integration and Demonstration phase shall include component level testing, system level pre-flight testing and limited flight testing as well as preliminary estimates for production capability and cost, and analysis of performance against requirements. The competing designs shall have the capacity to replace the current GMLRS DPICM warhead with enhancements relative to tactical capability and overall system effectiveness where possible. The resulting GMLRS AW designs, as integrated with the GMLRS rocket, shall comply with all applicable US Government environmental laws, regulations, and statutes. During the Integration and Demonstration Phase the warhead contractors shall refine their proposed design; conduct any necessary component performance tests (arena, drop, or other) to collect data against predictions; finalize/refine interfaces with the integration contractor's GMLRS rocket and identify any integration contractor hardware surrogates required for component testing; fabricate and deliver warheads for integration into the GMLRS rocket pre-flight testing and flight testing; and provide refined analysis of the effectiveness of the warhead against requirements identified in MLRS ORD. The contractor shall support integration activities with the integration contractor and shall support pre-flight testing and flight testing efforts. All such support efforts by the warhead contractors shall be inclusive of this contract. GMLRS AW components and subsystems developed and/or modified and tested under this contract shall be considered for future transition into an EMDD and possible cut-in to GMLRS production at a later date. The contractor shall fabricate and deliver four (4) warheads to the integration contractor to support preflight testing and flight testing at White Sands Missile Range (WSMR) no later than shown in Attachment 004. No Stockpile-to-Target Sequence (STS) or temperature testing will be performed on test rockets. The contractor shall plan to support three (3) missions of one (1) rocket per mission. Ranges, launch points and impact areas shall be coordinated among the Program Management Office (PMO), WSMR and the integration contractor. The M270A1 launcher will be used for these flights.